The name of the Organisation shall be the European Prison Education Association (EPEA). (i) To promote education in prison according to the Recommendation No. R (89) 12 of the Committee of Ministers to member States of the Council of Europe (1989). (ii) To support and assist the professional development of persons involved in education in prison through European co-operation. (iii) To work with related professional organisations. (iv) To support research in the field of education in prison. 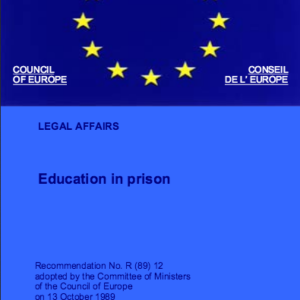 (b) ‘Education in prison’ is defined as formal, informal and non-formal education provided for all persons who are under the supervision of the judiciary, whether sentenced or awaiting trial, and whether serving a sentence in prison or in the community. (c) ‘Persons involved’ are defined as all those working in the field of education in prison and in related disciplines. (a) Full membership is open to individuals and organisations involved in the field of prison education, or in related areas with prisoners or ex-prisoners, in Europe. Associate membership is open to others. (b) The Steering Committee shall have the right to accept or reject applications for membership of the association. (c) An annual membership subscription shall be charged for each category of membership as determined from time to time by the Steering Committee. (ii) organisations: two votes for each organisation. Organisation representatives may not also vote in an individual capacity. (ii) organisation: two votes per organisation. (f) The Treasurer shall maintain an updated register of all members and this shall be available on request to any member. (a) All the elections within the association shall be by secret ballot, physical or electronic[i], and by means of the single transferable vote. (ii) its affiliation being approved by the Steering Committee. (iii) its adherence to the rules and policies of the Association. Branches may, if desired, divide into sub-units. Each country’s branch shall elect two liaison persons to represent it on the General Council, at least one of who should be in daily contact with prisoners. (ii) Each region will have one Regional Representative elected to the Steering Committee from among the members of the constituent countries of that region. The Regional Representatives will be elected by each regions Liaison Persons and serve the SC for a period of three years. If there is no concluding outcome of this election procedure, the SC will decide who will serve as the Regional Representative. (iii) The composition of Regional sections may be altered with the agreement of the relevant countries and the approval of the Steering Committee, or by General Council. (i) The General Council shall consist of the two liaison persons from each affiliated countryies Branch together with the officers of the association. (ii) It shall be convened at least once every two years. (iii) It shall determine policy of the association in accordance with the constitution. (iv) Liaison Persons who are unable to attend General Council can authorise another member of their branch to vote in their place. This authorization must be in writing and given to the Secretary prior to the General Council Meeting. (ii) Each person elected to officership of the association – with the exception of the Chairperson – shall be elected for a three-year period. (e) Chairperson: The person elected shall serve for one year as Deputy Chairperson, followed by three years as Chairperson. (f) No one member can serve more than 6 consecutive years in the same position on the SC (except for the Chair who can serve to a maximum of 7 years) without taking a subsequent break of 3 years before being allowed to take part in any reelection. If a Steering Committee member leaves before reaching their maximum term they may return after an absence of 3 years. (i) Each officer shall be responsible to the Steering Committee for the proper discharge of his or her duties. (ii)The Steering Committee shall administer the association in line with policies determined by the General Council. (iii) The Steering Committee shall meet at least three times every two years. (iv) Vacancies arising within the Steering Committee during a term of office may be filled for the remainder of the period by the Steering Committee itself. (v) The Steering Committee can co-opt non-voting specialists if they so wish, at their discretion and for a period of time and a schedule of tasks that they deem appropriate. The Chairperson will invite such individuals to Steering Committee meetings as dictated by the agenda. (vi) The Steering Committee can grant lifelong membership to those individuals who have significantly contributed to the growth and formation of the EPEA. (i) Three months’ notice shall be given of this meeting. (ii) The meeting shall be called by the Secretary. (iii) Notices of motion shall be received by the Secretary no later than six weeks prior to the meeting and circulated to participants no later than 21 days prior to the meeting. (i) Two months’ notice of Steering Committee meetings shall be given to Steering Committee members. (c) Regional Sections and Country Branches Regional Sections and Country branches shall devise rules and procedures for conducting their own meetings and business. These rules and procedures may be referred by any member to the Steering Committee or General Council for approval. (a) All monies raised by or on behalf of the Association shall be applied to further the aims of the Association and for reasonable expenses. (b) The Association shall keep proper accounts. (c) Bank accounts shall be agreed in the name of the Association. The Steering Committee shall authorise, in writing, the Treasurer of the Association and up to three other members of the Steering Committee to sign cheques on behalf of the Association. The Steering Committee shall determine the number of signatures required on transactions. (d) The Treasurer shall maintain the financial records of this Organisation in such a manner that will permit a successful audit by a competent auditor. (a) Alterations to this constitution shall receive the assent of no less than two thirds of those present and eligible to vote at a General Council meeting and the assent of more than half of those voting on a ballot of members. (b) A proposal to change the constitution must be received by the Secretary no later than two months prior to a General Council meeting and be circulated one month prior to the meeting. If the Steering Committee, by a simple majority of its full membership, decides that it is necessary to dissolve the association it shall call a General Council meeting for this purpose, giving the normal notice (as in 6 (a) iii above). A motion favouring dissolution must be approved by two-thirds of those voting at a General Council meeting. Any remaining money shall be disposed of as decided by the meeting.